It's our first challenge event of the year! 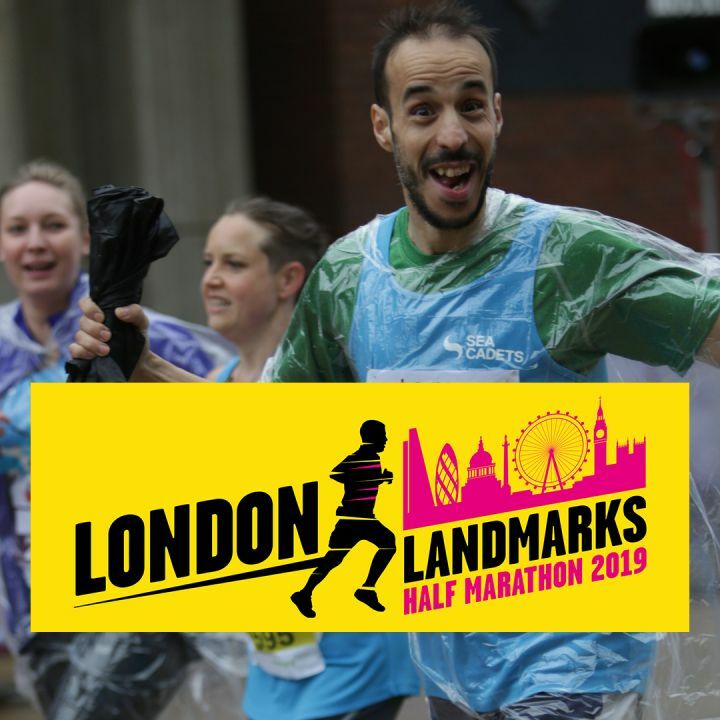 We have nine amazing runners taking on the London Landmarks Half Marathon to raise money for Sea Cadets on Sunday 24 March. To support these incredible runners we’re looking for enthusiastic cheerers to join us and help them all cross the finish line. Join us for a day that celebrates the history of our capital, with dance performances, bands and history tours along the route - all while cheering on our runners! To celebrate London’s ‘Grand, Quirky and Hidden’ history, we’ll have our very own Sea Cadet point on Trafalgar Square commemorating the Battle of Trafalgar, where we'll meet our runners before they start and cheer them on along the route. We will also have our Sea Cadets photo cheer point along Whitehall from 11.00am, so we’ll see our runners heading towards the finish line! Once our runners have finished you can join us to congratulate them on completing their half marathon, at the Sea Cadets finishing point on The Mall. Take a look at the map below to see where all our meeting and cheer points will be for the day! The Peregrine Trophy is back! Taken an impressive picture recently? 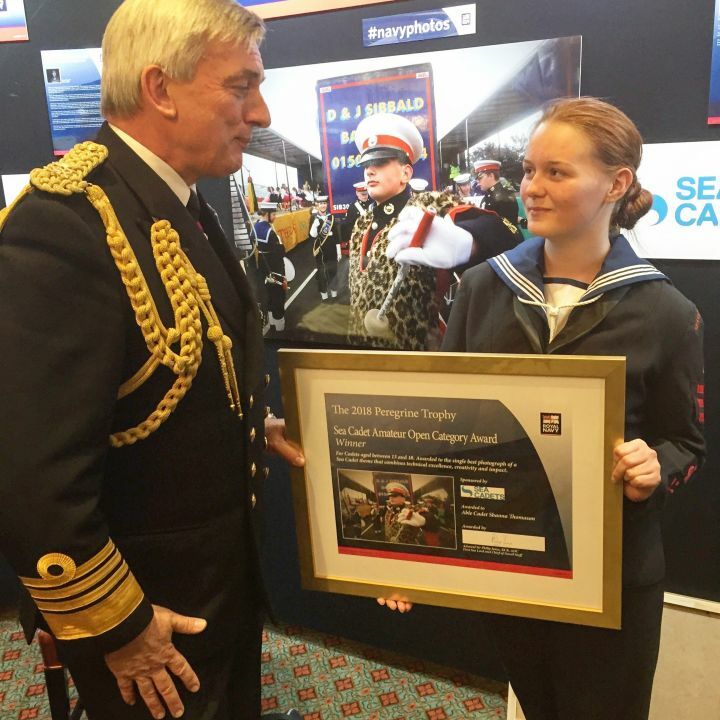 The Peregrine Trophy competition is back and we’re looking for pictures from cadets that represent the Sea Cadets experience in a unique way. It can be anything from an arty shot of your uniform to an epic snap of you sailing an RS Zest. Get creative and send in your best pictures, or if you have some still on your phone from after 21 April 2018 send them in! The winner receives a free offshore voyage and a Go Pro so email your entries to SCmag@ms-sc.org with your name, rank and age. Be quick, competition closes 19 April 2019. 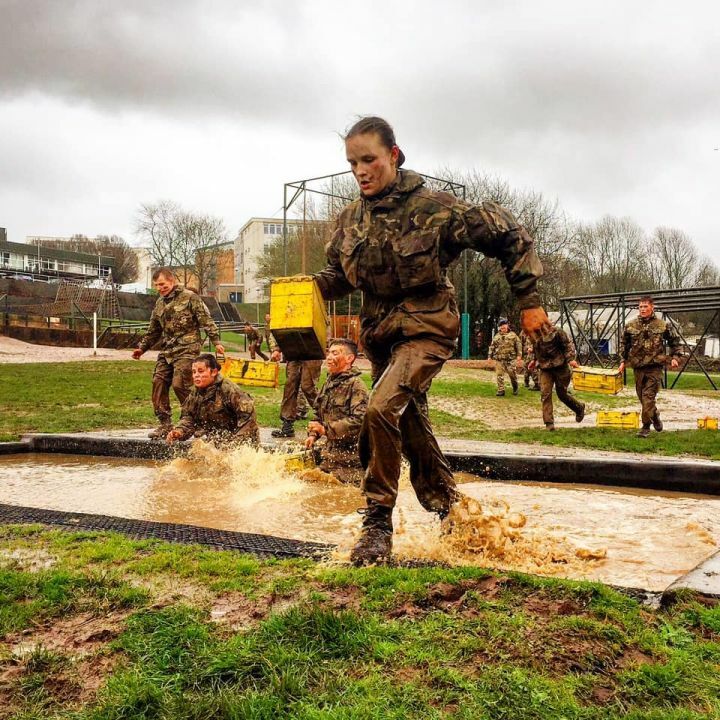 Six Royal Marines Cadet (RMC) detachments competed against each other at the weekend at the Royal Marines Commando Training Centre in Lympstone, Devon to take home the Gibraltar Cup. The weekend saw 48 RMCs complete a tough obstacle course as well as six leadership tasks that tested their navigation, teamwork and communication skills. This year it came down to the wire, with the winning detatchment taking home the cup by 1 point! Congratulations Caterham! Well done to Chelmsford for winning the best Team Leader Trophy and a congratulations to Sgt Liam Harrower from Caterham who was presented with the McCarrol Trophy for being the best RMC CFAV for 2018. Every single cadet was a credit to their Detachment, Unit and Company and should feel justifiably proud of their significant achievements. Hoofing effort! Loud cheers, hard work and great sportsmanship were all displayed at this years national football competition. Deputy Staff Recreation Officer Ray Mitchell said "All of the teams played to the best of their abilities with skill and good sportsmanship. It was great to see our new team of First Sea Lord's Cadets at the event as well. Overall a very successful weekend". 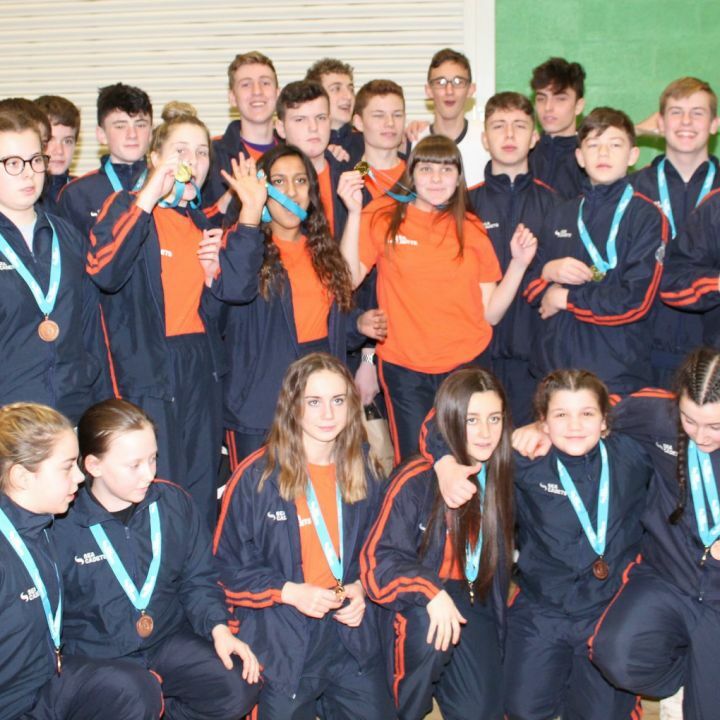 Teams from all over the UK gathered at the Graham Meres Leisure Centre to compete for the national championship. This years overall winners were Southern Area and Eastern Area jointly, but a big congratulations to all who competed. 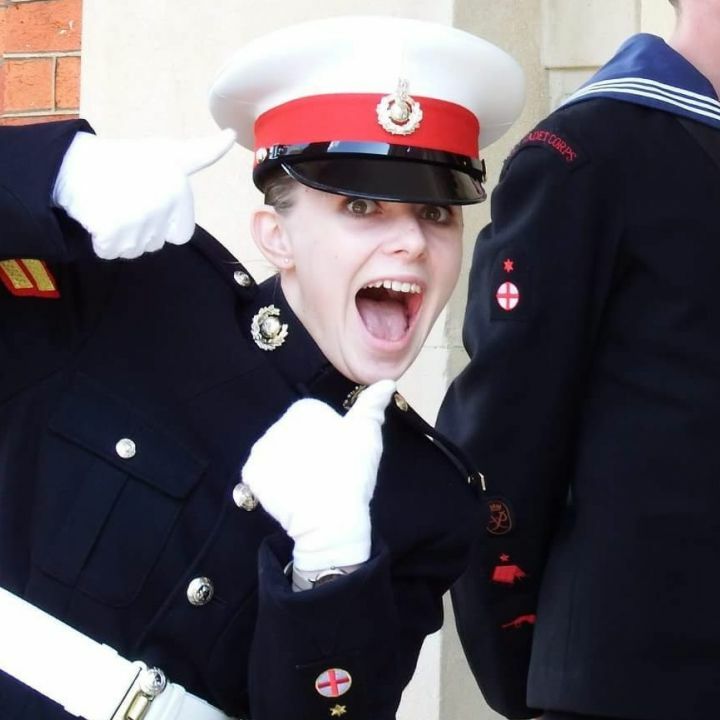 I am Cadet Sergeant Élodie, a Royal Marines Cadet in TS Leopold Muller, Flitwick & Ampthill, Eastern Area. I have been a cadet for five years, beginning my career when I was a junior. I love attending marine camps, shooting, piping, sailing and sliding seat rowing, and if there was one thing I could say to everyone involved within the SCC, it would be thank you. Why would I say thank you? Because everybody who works within this amazing charity organisation gives up their time to genuinely make not just mine, but many other young people’s lives better. In all honesty, without cadets, my life would not be as awesome or crazy, and I’m certain I can speak for many of us. So far, the year 2018 has been the best year of my cadet career, and to tell what happened would give the perfect opportunity to prove how grateful I am for the effort of everybody involved in the SCC. My year started off in January when the drill competition kick-started everything. Being a fairly young detachment of only nine cadets, our marines had never entered the drill competition before. Me, being the Corporal and IC of the detachment was guard commander, and I made up the routine for the drill. District was nerve-wracking for me, as I had entered drill competitions before when I was a sea cadet but as a marine, I was nervous for we were inexperienced. Yet, to our delight, we won and went through to area. At the area competition, we were up against some serious drill teams, two of which having attended nationals and one having won the previous nationals! We came runners up, which was terrific as for our first time doing the drill competition we had only lost to the last year’s national winners. The next thing that happened, was the Unit Review. In previous years our young detachment had dreamed of getting the highest score possible, but we’d never gotten it. But this year, we really pulled up our socks and managed to easily get a 5 out of 5, which was a massive contribution to our URV. Our DC was extremely pleased, and so he should be! He has worked incredibly hard to bring our detachment’s standards up. In all my five years of being a cadet, I had never gone on an offshore voyage. I can say now, after having gone on the yachts over the Easter week, it was one of the best experiences I have ever had. I cannot begin to describe how happy I felt during the entire week -the jokes, the freedom, the friendships, and the experiences were all hilarious and fun. Before I was slightly afraid of deep water (because of fish! ), and sailing on the Solent for the week helped me overcome that fear easily. I am so grateful to the offshore staff for giving us the best time on the offshore yacht, and I am planning on going on it many more times. The next few months of spring mainly consisted of weekends away, such as helping to teach on the pre-advancement board for the marines. I also did boating such as a week of sailing at Thrapston. Another thing that I did was enter competitions. I entered the area sailing for the 3rd year just for the fun of it, and the combined regatta. In my previous years, I had always entered double sliding seat rowing, but this year my partner had left cadets. Slightly disheartened at the idea of entering the yole single, I still managed to win district and then, surprising myself further, I won area. Considering we as a unit hadn’t had our unit-bought yole brought up to our lake yet, the fact that I managed to win area without training was shocking for me. Anyway, I had nationals to come soon but I wasn’t focusing on that just yet. I had the X-Ray Marines Summer Camp to attend for the 4th time. Royal Marines Summer Camp is definitely my favourite camp. I first attended it when I was a CFC as a sea cadet on basic troop. From that week, I was determined to one day be a JNCO on JCC, the highest troop. The next year I was still a sea cadet, and I was on intermediate troop, and the following year was rifle troop as a lance corporal. Now, this year I was a corporal, and JNCO. I had worked my way up through all the troops, and this year I was now attending JCC! My dream from four years ago was going to happen, because I had put in so much effort to get myself there. So, in August, I took part and completed JCC troop as a cadet corporal. After the camp, I was to focus on Nationals which was looming up. I was a little worried, but then again, who isn’t at competitions?! I started my first race, just telling myself that this was a great experience to attend Nationals for the second time, and I would just enjoy it and try my best. To my delight, I won Nationals and came first, bringing home the gold medal to X-Ray Company and Eastern Area. I was extremely happy and proud of myself, for the confidence that I had managed to muster in order to try my best was all thanks to being the Sea Cadet Corps. I could not have done it without the amazing experiences previously. By now, we had gained four more cadets including two transfers from the blue side, and the next thing to focus on was X-Ray Coy’s CATSEA (Company Annual Training and Safety Efficiency Assessment) weekend. As a young detachment, we were not the most experienced, but I personally had previously had two CATSEAs. In 2017, we had achieved a ‘satisfactory’ with a rate of 50%, which was decent enough. But this year we wanted to aim much higher, and so, after our enthusiastic training, we managed to obtain a ‘good’ with the amazing rate of 82%, scoring the third highest out of the largest company. This amazing achievement is not only down to our brilliant detachment, but also our DC, whose hard work and effort to train us up to our standards has proven to be successful. Just as CATSEA finished, another amazing thing happened. I had been chosen to be the Lord Lieutenant’s Cadet for Bedfordshire, scoring a hat trick for our unit (being the third cadet from TS Leopold Muller in three preceding years) and the first Royal Marines Cadet for Bedfordshire. This was a great honour and for that, I am so grateful that I was chosen. By now it was November, and at the end of this month was the final advancement board of any Royal Marines Cadet: the Cdt Sergeant’s National board. Having been joint first Lcpl of our unit, and then first Cpl, I had no idea what to expect for the Sgt board. With the good training from the company, I turned up on the board determined that I would achieve the pinnacle rate of the RMC. I can say that I did manage to do it, and the fantastic memories and friends I made at the same time truly made the weekend incredible. The staff, as well as the cadets put in a huge amount of effort and the result, was outstanding, and yet again I can proudly say thank you to everyone who was involved for making my sergeant board awesome. Just as I thought the year could not get any better, our unit, having just won the Stephenson trophy for the best unit in Eastern Area, got the news that we, Flitwick & Ampthill Sea Cadets, had won the Canada Trophy -officially recognising that we are the best unit in the country in 2018! I am so thankful to my entire unit, P&SA, and staff, who without them could not have made this highest achievement come true. So I can conclude this brief summary of my amazing year as a cadet, with the hopes that my reasons to be incredibly thankful to the Sea Cadet Corps are definitely proven. I also hope that this may be an inspiration to all the younger cadets, so that they may know just how fantastic the corps is. Thank you, once again, Sea Cadets and Royal Marines Cadets!